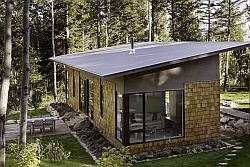 Homeowner Kol Peterson provided these photographs of his appealing shingled cottage. 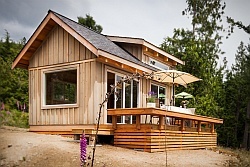 It is an accessory dwelling unit (ADU), a small house built in the back yard of an existing house. 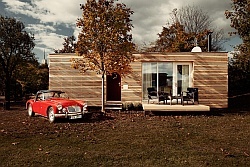 ADU’s go by many other names as well…carriage house, laneway house, backyard cottage, granny flat. ADU’s are often occupied by relatives of the property owner, for example allowing an aging parent to live semi-independently but with support nearby. Other ADU’s are rented out, providing an affordable alternative to apartments. The design is by Studio Eccos Design. There is one bedroom and an office in 799 ft2 (74.2 m2). The office is small but could potentially be used as a second bedroom. There is also a bonus attic room, accessed via an alternating tread stair, which is not included in the floor area number. The living room, dining room and kitchen are open to each other, but varied ceiling heights define each space. The middle third of the house, containing the dining room and staircase, is open to the peak of the roof. A small bridge crosses overhead, connecting the upstairs bedroom and bathroom. This open volume in the center of the house allows for long views across the house and between floors. The bridge, stained glass windows, and the interesting angles of the house itself provide for eye-catching views. A set of French doors leads from the dining room to a covered porch. The yard has been landscaped to define distinct outdoor rooms with a seating around a fire pit in the middle and an outdoor dining area to one side. Peterson notes that ADU’s have a number of environmental benefits deriving from increased urban density and small house living. Higher urban density greatly reduces the energy spent on transportation. Transit becomes increasingly efficient, and walking and biking become viable options. A reduction in urban sprawl also means less destruction of wilderness and farmland. 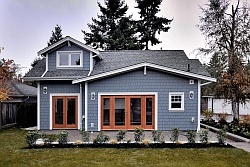 ADU’s, like other small homes, require fewer materials to build, use less energy to heat and cool, and need less chemical cleaners than bigger houses. 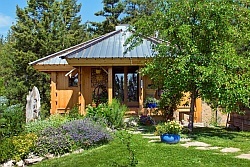 Peterson went one step further by building his ADU to be extra energy-efficient. He focused on the simplest and most cost-effective strategies, using very high levels of insulation and taking advantage of the natural shade provided by a large cherry tree. The house was built by Design Build Portland. Peterson documented the construction on his blog, pdxadu.blogspot.com. He is also a contributor to accessorydwellings.org, a site which advocates for ADU’s and provides guidance for people thinking about building one. Awesome floorplan! I totally love the layout and use of space. Great idea using the attic as a bonus room. Thanks for sharing this. Thanks for stopping by Cory! This is one of the nicest homes, including large homes! Great design, really nice use of space. Doesn’t seen small at all. 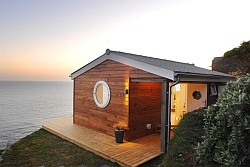 This is the best small house I have ever seen. LOVE it! Do they have the plans for sale? I’m interested in the cost of building this … any details?